I'm writing because I'm hungry. I'm hungry for words, hungry for content, hungry for opinions of opinions of opinions. Facebook, Twitter, and RSS feed me through my computer, phone, tablet and -- occasionally -- even through a Tube. I've sampled writings about the Obama marriage and whether or not the union -- at least, the profoundly captioned photographs of it -- can make as weighty an impact on positive images of Black Love as television's fictional Huxtable family. I agree that media is powerful: images and text and representations are guiding forces and influences in our lives. I saw Django Unchained (twice), then feasted on myriad perspectives about the film's liberal use of the N-word, some arguing that words only have as much power as we give them. And I disagree. Words have powers and resonances and elaborate historicities of their own. American culture, fed by interminable channels of news and information, remains hungrier than ever for conversation about how we are going to talk about whatever it is we need to talk about. Our language and the ways in which we use it can teach us about our subconscious biases, teach us where we lack in understanding, and teach us new means by which we can say just what it is we mean. In 2012, I was incessantly starving for explanations. I wanted to know why, armed with an Ivy League education and degree, even the most menial, unglamorous of employment opportunities remained at an arms length. I wanted to know why my stomach still rumbled with agitation at the thought of not only trying to break into an impossibly unrelenting entertainment industry, but also to do so as a queer woman of color. Experience would not permit me to worship at the altar of individual exceptionalism, an American invention insisting that the systematic marginalization of women, racial minorities, and LGBTQ-identified persons would play no role in my personal narrative. I wanted to know why literal hunger clouded each of my days, pangs pounding my abdomen to the tune of a government assistance program allotting me $5/week less than what left Corey Booker crying "famished." Still, my pride fell victim to the most intense pain: my upbringing had consisted of nothing but positive images of interracial love and objectivism inherited from hardworking, middle class parents who'd taught me to believe anything I wanted could be mine. In 2013, I'm still hungry for words that form answers to questions, for conversation about the insidious -- often invisible -- advantages and disadvantages that have discernible, even corporeal, impact on our lives. "Progressive art can assist people to learn not only about the objective forces at work in the society in which they live, but also about the intensely social character of their interior lives. Ultimately, it can propel people toward social emancipation." -- Angela Davis, "Art on the Frontline, Women, Culture, & Politics (1984). In 2012, fueled by a desire to learn about the "objective," unspoken "forces at work" in my own life, I returned to a script I'd written three years prior, a script whose origins were the product of a conversation around a Brown University cafeteria table. In early 2009, I entered an exchange amongst a lively crew of my college peers regarding racial representation (and lack thereof) in popular culture: specifically, television. 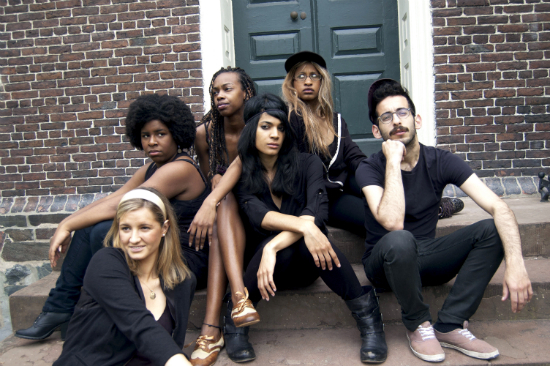 We debated what a TV show documenting the lives of black students at Brown would look like. Prepaid meal plan ensured we made it our afternoon classes well-nourished, but our conversation left behind appetites only whetted for more words. The 2008 presidential race had purported to forever erase the conversation about race in the United States, but here a conversation about race compelled my producing partner and I to create a satiric, mockumentary-style study of race relations in the Ivy League. Where better to begin an "intellectual," productive discussion of race, class, and sexuality than in the halls of "higher education," a place where we are all supposedly given (1) the vocabulary to speak intelligently about culture and (2) the tools to change it? Nick White and I decided to christen the series after a popular campus food item combining chicken, cheese, and carbohydrates to levels of certain cardiac catastrophe: the "spicy with." The name Spicy Wit carefully and deliberately engages our content with deeply rooted, damaging associations between African-American experience and fried chicken; it alludes to our ultimate goal: encourage others to get fired up talking about race, and equip them with humor and a platform to do so. In the shadows of labyrinthine American history, complex social structures, and ever-elusive political correctness, Spicy Wit wants to cultivate an environment where failure to accurately express oneself is both inevitable and uproarious, and, therefore, welcome. To shine a glaring, inquisitive light on awkward encounters with the politically incorrect -- to practice "spicy wit" as a principle -- is to mix a dash of attic salt in with the most terrifying, absurd, and painful truths and ultimately make them more palatable. The Spicy Wit team wants to use the Internet and film as forums to talk about race and education and race in education. The Internet because it provokes and challenges individuals to brave passivity and paralyzing Chicken Little syndrome when it comes to their own opinions, subconscious biases, and words. Film because it allows for multiple tries and shots and takes, multiple attempts to find the "right" visual, aural, and verbal language to say just what it is we mean. A version of this post originally appeared in post- magazine.